Hello folks, welcome back to my blog, hope you are ready for a new adventure. This time I promise it is going to be an adventure with the capital A. I’ve been working on a finite element method algorithm using C++ (and later CUDA) to prove that the latest generation of mobile devices (more specifically the Kepler architecture in the Shield Tablet) is capable of running such complex algorithms. Setting up the environment is not too difficult too. I used the Tegra Android Development Pack, that installs, all the tools you need to start developing on Android (including extensions for Visual Studio and the whole Eclipse IDE). After a few clicks you have everything up and running. I need to load 3D models. Albeit I could have written my own parser (which I think it could have been less painful) I decided to use Assimp instead. Assimp is a very handy library that can handle a plenitude of different file formats. I’ve used it extensively in all my projects so far. It supports Android and iOS (as it is stated on its GitHub page). I read the doc a lot, but I found no easy way (well at least under Windows) to generate a Visual Studio solution (sorry I’m a Visual Studio addicted) to compile it using the Android NDK. I searched on the web for a long while and I found a couple of articles that explain how to compile Assimp for Android (this: Assimp on Desktop and Mobile and this other: Compile Assimp Open Source Library For Android). The procedure is quite troublesome, requires Cygwin under Windows and a lot of patience. Luckily in the second article mentioned above, the author posted a pre-compiled assimp 3.0 version lib with headers included. Download Assimp 3.0 lib for Android here. Having Assimp already compiled was truly helpful. It saved me a lot of time that I would have spent figuring out how to put everything together. Here it comes the tricky part. Assimp was compiled as a shared library (an .so). To reference it is pretty easy. The include and the lib path have to be set and then the name of the library specified. Visual Studio doesn’t use the Android.mk (whereas Eclipse does I think) that tells the Ant build and the the apk builder how pack the apk, which local shared lib to include. It is to be done in the project’s properties instead. “java.lang.IllegalArgumentException: Unable to load native library: /data/app-lib/com.shield.fem-1/libShieldFiniteElementMethod.so”, which told me absolutely nothing about the nature of the problem. Fortunately the only thing I knew I changed was the reference to Assimp. It was clear to me what was that the cause of the problem. But why and how wasn’t explained at all by the log files. It was easy to spot it though. I looked at the output window and libassimp.so (see Figure 2 below) was not included at all. I found two solutions for this issue. I like to call them respectively “The easy way”, and “The way of pain”. I had already added an external library (I had to use libpng for loading textures), but in that case it went smoothly because it was a static library. Static libraries are .a (or in Windows .lib) files. All the code relating to the library is in this file, and it is directly linked into the program at compile time. Shared libraries are .so (or in Windows .dll, or in OS X .dylib) files. All the code relating to the library is in this file, and it is referenced by programs using it at run-time, reason why it is not deployed with the apk unless explicitly told. DISCLAIMER: This solution involves rooting your device, so I’m not responsible if warranty voids. Please do it at your own risk. The only solution as I said is to root your device first. This can be quite painful and it depends on your model. There are a few good guides around. Use google, take a cup of coffee and have a lot of patience. Personally to root mine (a Shield Tegra) I used this guide, and the app adbd Insecure available on google play, that lets you run adbd in root mode once your device has been rooted. Figure 3 – Upload has been successful! At this stage I didn’t have to do anything really. Once the application starts it will load Assimp (and any other libs in there) automatically. I found out this easier solution only after I went through hell using the first painful approach (trust me it took me a while to understand how to root the device and which commands to run). Here you don’t need to root your device at all, but you will have to change your code a little bit to dynamically load Assimp (shared libs in general though). Let’s start! Using this approach the shared library is built seamlessly into the apk! The only drawback is that it won’t be loaded automatically! For this issue another little trick is needed. If you try to execute/debug your program now, you will likely get again the same error message as in Figure 1. It is important that Loader.java goes under the folder src in your project and that it is wrapped in a folder structure that respects your package declaration (I know if you’re a Java guy it is evident for you, but I’m more a C#/C++ one so it took me again a while to figure it out 😛 ). The last bit: change your AndroidManifest.xml android:hasCode must be equal to True and change the android:name in the activity tag from android.app.NativeActivity to Loader (i.e. the name of your Java class). 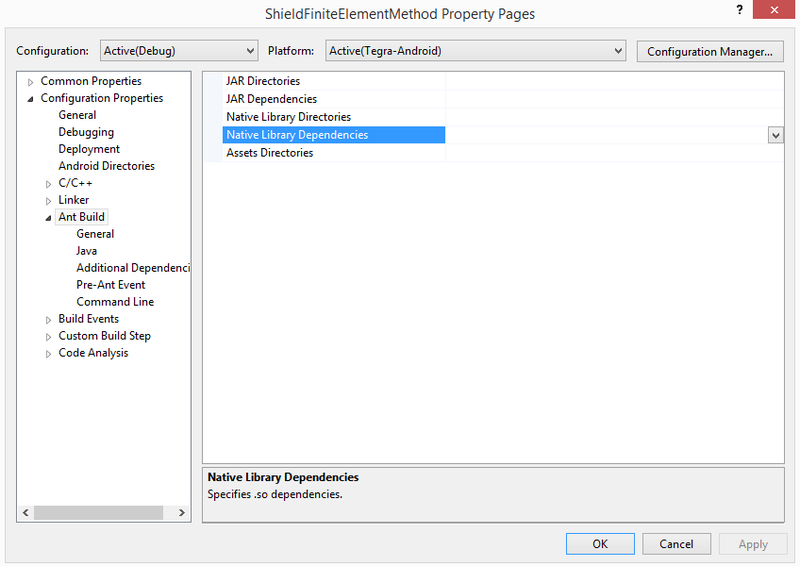 I’m a total newbie with Android development and it’s been quite hard for me to figure out how to deploy a shared library in Visual Studio as it wasn’t very intuitive. A lot of examples I found online use command line scripts to compile and/or different IDEs. The most common approach is using an .mk file where properties, libraries etc are defined inside. Mk files are (apparently) completely ignored by VS so it wasn’t possible for me to use one. I really hope this article can help you. I am looking forward to reading your comments, hoping that there are other simpler ways to achieve what I did today.